Can it really be fifteen months since I reviewed the first edition of the Dictionary of Financial Remedies? It can and it is. What is new in this edition? Well, it has apparently "been fully updated as at the 1st January 2015 to reflect changes brought in by the implementation of the Family Court and a host of important cases since publication of the first edition in October 2013." 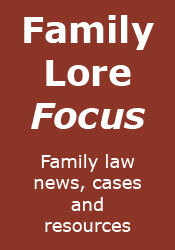 There is also a brief revised foreword by The President of the Family Division, Sir James Munby. Subject to those updates, and without comparing the text of one edition alongside the other, the actual content of the 2015 Edition of the Dictionary seems pretty similar to the first edition, certainly in terms of subjects covered. All the old entries are there, plus three new ones, on criminal confiscations and restraint orders, Mostyn J's Efficient Conduct of Financial Remedy Final Hearings statement and judgment summons. As it is similar to the first edition, I am not going to comment upon the content of the new edition - you can simply refer to my previous review for that (a full list of the contents is here). Instead, I thought that as it is intended as a reference book rather than a textbook, a more helpful thing to do would be to try to evaluate the usefulness of the Dictionary generally by recalling how often I have referred to it in the last fifteen months. The answer is quite a lot, and I am not practising - I suspect that anyone who is would refer to it considerably more. Provided that it is recognised that the Dictionary is intended more as an aide-mémoire, rather than a comprehensive reference, then I think all family lawyers who engage in financial remedies work would benefit from its presence on their bookshelf (or, indeed, in their briefcase/bag). Dictionary of Financial Remedies can be purchased from Class Legal, here. A digital edition is also available via Class Legal's website. Life is short. Definitely don't have an affair.